Hi! I am the owner of Kokopelli's Kitchen, a line of Southwest specialty foods originally based in 1995, that is based in Phoenix. I love the UNIQUE flavors of our foods - such as mesquite, blue cornmeal, pine nuts, chile powder, diced jalapenos and posole (to name a few)! My blog is dedicated to all other foodies out there! If you're in search of a great welcome gift for a special event in Arizona, consider southwestern food! Edibles are a unique, fun way to welcome guests to special events such as weddings & family reunions, conventions and corporate events such as conferences. All of the products produced by Kokopelli's Kitchen are indigenous to the great Southwest. The corn, beans, spices & other ingredients were largely used by the prehistoric Indians to create the foods they enjoyed and that carried the people from one growing season to the next. With the introduction of Anasazi Bean Soup, Kokopelli's Kitchen is proud to continue the tradition that began with the Pueblo Indians more than 15 centuries ago*. Modern palates can now enjoy the flavors lost over the centuries! *A bowlful of Anasazi beans were discovered in a dry cave in 1991 - these beans were placed in the cave nearly a thousand years ago by the Pueblo Indians. In fact, Kokopelli himself may have carried these beans up from Meso-America and traded these life-giving foods for turquoise & other exotic items to fill his backpack. Jean was raised on a Kansas farm during the depression and learned to eat anything that was put before her. Her slogan is “I eat anything that doesn’t eat me first”. Jean doesn’t believe that there is a plant going (that is safe to eat) that can’t be made into some kind of delicious jelly. Hey there, thanks for the follow. I look forward to sharing recipes. 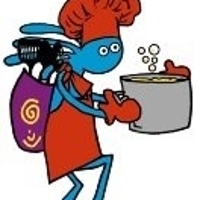 Thanks for following me Chef Kokopelli ,looking forward to your recipes on cook eat and share .